AltCon, the famous Los Angeles comic convention, turned nine this week. 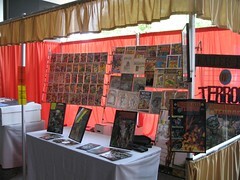 Hundreds of fans and vendors turned out for the event, which featured the unveiling of a rare comic by wealthy creator Miles Sklar. What’s that? You haven’t heard of Sklar or AltCon? That’s not surprising, because they only exist within the televised world of NUMB3Rs, on CBS. The level of detail is astonishing, from the posters on the walls, to the booths staffed by actual comic creators, to the gaming and media booths, to the 150 extras dressed as cosplaying fans. I’ve taken as many pictures as time and security will allow, and I’ve put them in my flickr stream. The episode airs on November 23, so set your TiVos and tell your friends that you knew about AltCon way back in the old days, before it got commercial. Man, AltCon was better back before it sold out. Adam’s onto something. Wil, you pimp Threadless pretty solidly…any contacts you’ve got there who could whip something up? Previous PostPrevious Ou est frazgo?